Nicole Power (who plays Evelina) writes in her Soulpepper Artist Programme Note that she is grateful for her time with this incredible group of artists in Sisters. From an audience standpoint, I couldn’t agree more with her on this opening night. Sisters’ Director Peter Pasyk has crafted a beautifully compact and intense story of women who are just trying to survive and get by. Ann and Evelina Bunner (Laura Condlln and Nicole Power) run a small but struggling millinery shop in a tacky New York neighbourhood, at the turn of twentieth century, which also serves as their cramped home. Business is unsteady at times, but Ann and Evelina do their best to make ends meet. They cope with the challenges and obstacles in running their shop and its varied personalities of customers (Raquel Duffy and Ellora Patnaik), sometimes with a sense of humour. The entrance of clockmaker Mr. Ramy (Kevin Bundy) into their lives changes them tremendously. Will Mr. Remy possibly provide a way for these women to cope with so much that life has thrown at them? The concept of time is of utmost importance in this production. Michelle Tracey effectively captures a bygone moment in time with her compact set design. A peeling picture frame, which shows its age, enclosed the playing space. A single bed just off-centre left is all that is needed to suggest the tight quarters in which the sisters must sleep. A work station which becomes the counter in which Ann and Evelina serve the customers can be found off centre right. I thought the playing space was only one level; however, there is a second hidden level which worked well as the play opens. Customers in the present time enter from stage right with a sound cue of a jingling bell which indicates someone has entered the store. Grand orchestral music greets the audience upon entering the Michael Young Theatre. Erika Connor’s costumes appropriately reflect the period of the early twentieth century. Kimberly Purtell’s lighting design is sharply focused in the present day. A hint and tinge of shaded darkness nicely transports us to past moments far stage left and right. Richard Feren’s sound design of the ticking clock hauntingly echoed in my mind in each of the scene changes. My attention was immediately focused on the first few silent moments at the beginning of the play. Ann (Laura Condlln) purchases a clock for her younger sister’s birthday from the initially shy shop owner, Mr. Ramy. Condlln and Bundy were completely focused in their movement in capturing a very ordinary and daily routine of customer and shopkeeper. From where I was sitting, Ms. Condlln’s eyes told so much in the fact she was smitten by this initially shy man that I hoped there would be a budding romance between the two. Was I ever sorely mistaken as the story’s timeline progresses quickly. Self-centred younger sister Evelina (Nicole Power) continues to bemoan the fact that the only suitor who was interested in her left her years ago without any explanation. To sacrifice a possible chance at happiness and not tempt fate, Ann quells her feelings for Mr. Ramy and tries to fix things in such a way that her younger sister might find happiness with the clockmaker. Ms. Condlln and Ms. Power are engaging, charming and believable as the title characters. Sisters is by no means an easy play to stage because there are layers upon layers of character development that occur quickly in this ninety-minute plays sans intermission. I was fascinated in the way the women constructed distinctive characteristic traits in their performances, especially in those times where their conflicting feelings for Mr. Ramy sometimes bubble at the surface level. Once again, I mention Ms. Condlln’s eyes because they conveyed so much turmoil and heart break. Ann was forgoing her own chance at happiness to a sister who appeared to be used to getting her own way. Ms. Power’s inherent girlish foolishness in being smitten with Mr. Ramy intrigued me as I kept thinking her behaviour was certainly going to cause problems with the man. Again, without spoiling any further plot elements, Ms. Power’s performance for me was touching to watch as we begin to see what drama befalls these sisters. Kevin Bundy is magnetic, drawing and unnerving as Mr. Ramy. Shakespeare wrote in The Merchant of Venice ‘all that glisters is not gold’ and that same statement applies here as well. While Ramy appears initially modest and unpretentious as he recovers from an ailment, his quickness into a marriage with Evelina, demanding she convert to Catholicism and taking her away from her sister to St. Louis left me a tad unsettled. Karen Robinson as the upstairs neighbour Mrs. Mellins thankfully provided for me some much-needed humour and wit as the story takes several dramatic dips and turns. 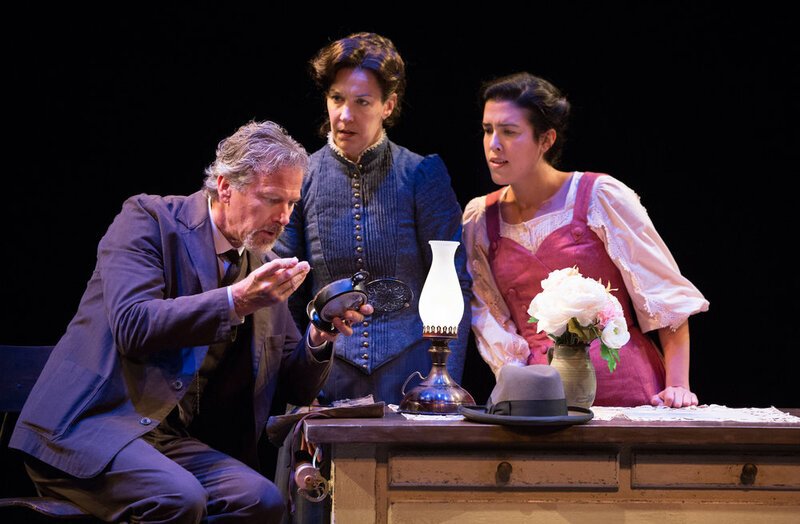 Final Comments: The Background Notes informed us that playwright Rosamund Small, a recent graduate of the Soulpepper Academy, adapted Edith Wharton’s Bunner Sisters for the stage. It’s heartening to know that Soulpepper trains its’ graduates to continue their craft on home base territory within the two theatres here at the Young Centre. As the pieces continue to be picked up, let’s hope there is more opportunity for theatre of this calibre. Sisters continues to September 16 at the Young Centre for the Performing Arts in Toronto’s Historic Distillery District, 50 Tank House Lane. Visit www.soulpepper.ca for further information or telephone 1-416-866-8666. Photo of Kevin Bundy, Laura Condlln and Nicole Power in Sisters provided by Cylla von Tiedemann.